Building on the momentum and achievements of the Global Article 9 Conference held in May 2008 in Japan, as well as on the Article 9 and Article 12 Conference - Peace Constitutions for Global Disarmament that took place in Puntarenas, Costa Rica in July of 2009, the Global Article 9 Campaign to Abolish War, Peace Boat, and the International Network for the Abolition of Foreign Military Bases (NO Bases) co-organized an International Peace Constitutions Conference for Nuclear and Foreign Military Base Abolition. 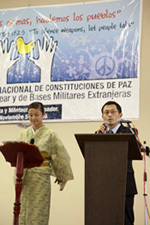 The event took place on November 5 and 6, 2009 in Manta and Montecristi, Ecuador, where US operated a military base since 1999 and where the country's new peace constitution was written and adopted in November of 2008. The conference focused on the concrete functions and outcomes of peace constitutions, especially in the areas of nuclear weapons abolition and foreign military base abolition. Like Article 9 of Japan's Constitution, which renounces the maintenance of armed forces and war as a method of settling international conflicts, Article 416 of Ecuador's Constitution promotes the peaceful resolution of conflicts and rejects the use or threat of use of force. It also promotes universal disarmament, and condemns the use of weapons of mass destruction, as well as the imposition of military bases by States in the territory of other States. 1. Proclaim the independence and legal equality of States, the peaceful co-existence and the self-determination of peoples, as well as their cooperation, integration and solidarity. 2. Advocate the peaceful solution of controversies and international conflicts, and reject the threat or use of force to resolve them. states, and any form of intervention, aggression, occupation, or economic or military blockade. 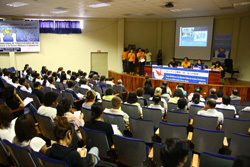 The conference included sessions on peace constitutions, foreign military base and nuclear weapons abolition, as well as testimonies from some of the ten Hibakusha - or survivors of the atomic bombings of Hiroshima and Nagasaki who are currently travelling with Peace Boat as part of its Global Voyage for a Nuclear Free World - Peace Boat Hibakusha Project. Among the speakers figured Helga Serrano (NO Bases), Verónica Macías (Youth in Movement), Shinshaku Nohira (Peace Boat), Luis Saavedra (NO Bases) and Odalys Lopez (Cuban Institute for Friendship with the Peoples) who addressed the issue of the elimination of foreign military bases; Akira Kawasaki (Peace Boat), Carlos Vargas (IALANA), Lina Cahuasquí (NO Bases) and Carlos Crespo (World March for Peace and Non-Violence) spoke on Nuclear Abolition and Peace Constitutions. Performances , cultural workshops and a peace festival also took place. In addition to the conference, a delegation of Hibakusha met with key high level officials in the Ecuadorean government in Quito and the mayors of Montecristi, Manta and Portoviejo joined the nuclear disarmament initiative "Mayors for Peace" in a special ceremony. The conference culminated with the Manta and Montecristi Declaration, which calls on world governments to take concrete steps towards the abolition of nuclear weapons and the strengthening of international mechanisms for arms control, non-proliferation, and the disarmament of ALL weapons. The document also makes a plea for the universal dismantling and removal of existing foreign military bases and opposes the construction of new ones. Finally, it urges governments to adopt pacifist clauses in their countries' constitution similar to those adopted by countries such as Ecuador (Art. 5 and 416), Japan (Art. 9), and Costa Rica (Art. 12) and encourage the adoption of a UN resolution that recognizes the role that peace constitutions can have in the promotion of global security and disarmament for development.